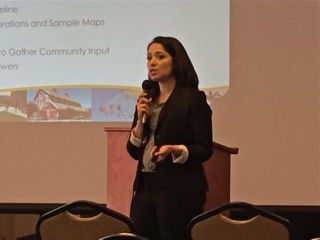 My sweet and very patient wife and I spent a few minutes at the second community meeting designed to inform the public and gather input for the process of creating voting districts as required by a lawsuit apparently filed to enforce a perceived violation of the California Voting Rights Act. 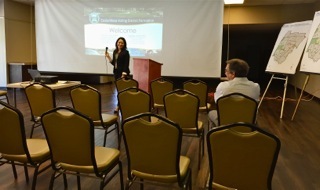 This meeting, held for a couple hours at the Halecrest Park meeting facility this morning, was billed as a duplicate of the one we reported on last Thursday. We, along with a smaller crowd of fewer than 24 residents, sat through the beginning presentations by consultants hired to facilitate this process. 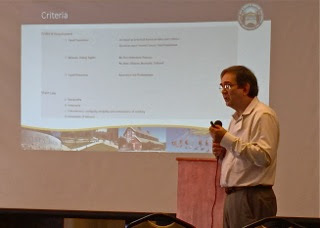 Demographer David Ely presented the information again and responded to questions, again. We left as they were about to break into smaller groups for the exercise of creating maps that represented the preferences of the smaller groups. I noted that there were only three Latino people attending this meeting that required translation assistance, and they left early. At the earlier meeting there was grumbling from social service organizations that there had been virtually no time to organize folks to attend the meetings. Ely will now homogenize the information he received at these two meetings and compile new maps that take into account not only the information gathered at these two meetings, but the earlier mini-meetings, billed as "Meet The Expert" meetings. On June 15th and June 18th there will be two more meetings where that information is presented and members of the public will be encouraged to add further input and discussion into this process. After THOSE meetings Ely will present information during a public hearing on July 5th. The council is scheduled to make a decision on which map to place on the November ballot at their only meeting in August. A couple things came up during this meeting. First, it is possible for the council to arbitrarily decide to NOT place the issue before the voters and just select one of the maps and adopt that change. I had the impression from the way Ely discussed that issue that he thought such a move could/would result in legal action. Also, if the public votes to NOT choose to change the way we elect council members in November the lawsuit that is driving this action will likely move forward and a judge will ultimately decide how districts will be formed. Assuming this issue will appear on the November ballot, the earliest the City will begin selecting council members by district would be in the General Election of 2018, when two positions will be open. In 2020 the three remaining seats will be up for grabs. It's still unclear how this process will actually shake out. Also, because there will be a new census in 2020, and because the sensitive Westside area that seems to be the primary focus of this activity is morphing as we write this with hundreds of high-end housing developments being built in the heart of that area, it's possible the demographics of voting age people in that area will change - which will require this process to be tackled again. That's pretty discouraging, to say the least. These meetings have been poorly advertised, hence the turnout of only around 50 people at both of them. I certainly hope the City does a better job of advertising the remaining two meetings and the two public hearings in July and August when this monumental change to the way our city is governed takes place. Assistant CEO Rick Francis and City Clerk Brenda Green both attended this second meeting. I certainly hope they took notice of the sparse attendance and will do something about it for the future meetings. Information on this process, including links to displays and an email address to which members of the public may send their own ideas about voting districts can be found at the City Website, HERE. I was surprised to learn that there is an option, compatible with general law, to have seven (7) districts rather than five in the city. In my opinion, this is an option to be recommended. It would make dictatorial control of the city by an unholy triumvirate impossible, whereas instituting elections by district would only make it unlikely. It still wouldn't make it necessary for the council to listen to, and heed, the earnest entreaties of citizens, but it would certainly make it more likely that they would do so. Righeimer's assumption of absolute authority, manifested at the April 26 debate between him and Jay Humphrey when he said, "you elect people to councils, they put people on planning commissions, and if they don't do well, you unelect them" (11:12 into Barry Friedman's video of the meeting), should have generated far more than my own outrage. I am just astonished that such a statement, worthy of a Hitler or a Stalin, has not been challenged. What he was saying here is that his forty-seven vote plurality gives him unchallenged, absolute power to do exactly as he pleases, until the next election or recall. Hey, we are Americans, dammit. The council members are our REPRESENTATIVES, not our BOSSES. What country is Righeimer from?